Climate policy developers and natural resource managers frequently desire high-resolution climate data to prepare for future effects of climate change. But they face a long-standing problem: the vast majority of climate models have been run at coarse resolutions—from hundreds of kilometers in global climate models (GCMs) down to 25–50 kilometers in regional climate models (RCMs). The field of high-resolution climate modeling has the potential to more accurately represent regional and local climate features. Lacking higher-resolution information from climate models, these experts heavily rely on statistically downscaled GCMs and RCMs. Fortunately, the field of high-resolution (1–20 kilometers) climate modeling (HRCM) is rapidly developing and has the potential to more accurately represent regional and local climate features. 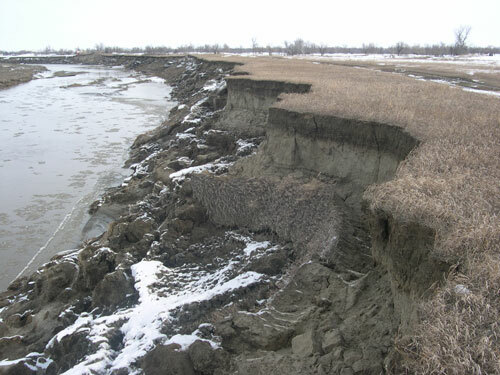 The North Central Climate Science Center and the Physical Sciences Division of the National Oceanic and Atmospheric Administration’s Earth System Research Laboratory convened a workshop in Boulder, Colo., to address how HRCM projections might better inform socioecological adaptation projects in the United States’ northern Great Plains. Climate modelers and other expert users of climate data, primarily ecologists, attended the workshop, which was structured around three major themes: precipitation, land surface feedbacks, and HRCM usability. Climate modelers discussed the ways in which HRCMs highlight important processes in the region and their response as climate changes, for example, orographic snow, organized convection, and the effects of land use change and irrigation. Participants determined that HRCMs can adequately represent these processes at varying resolutions—from 20 kilometers to convection-permitting scales (<4 kilometers)—depending on the process and application. Ecologists recognized value in HRCMs’ ability to represent land surface characteristics at ecologically relevant scales, as well as the increased realism of land-atmosphere feedbacks simulated at those scales. However, participants stressed the importance of validating HRCM model output at application-relevant scales but noted that available observational data sets for ground truthing are often deficient. Ecologists felt that at present, statistical downscaling is still appropriate for many applications. Given these trade-offs, ecologists felt that at present, statistical downscaling is still appropriate for many applications, especially when using long-term average information at very fine spatial resolution. However, they also recognized that greater HRCM data set accessibility may enable impacts modelers to consider different sets of climate drivers that more accurately represent the climate sensitivities of their particular socioecological systems. Ecologists saw the value of HRCM insights in helping to broaden and quantify the range of plausible future climate scenarios, particularly changes in extreme climatic events. Ultimately, participants agreed that sustained interactions and coproduction between climate modelers and users is crucial to increased usability of HRCM output. Participants’ information and a more detailed synthesis of the discussion from the workshop can be found on the workshop’s website. Citation: Rangwala, I., C. Dewes, and J. Barsugli (2016), High-resolution climate modeling for regional adaptation, Eos, 97, doi:10.1029/2016EO048615. Published on 25 March 2016.